Beautifully presented, this lovely studio flat is set on the top floor and boasts bright living space and a smart bathroom, located close to both Barnes Common and the River Thames. The property is moments from local amenities and within easy reach of the shops and restaurants of Lower Richmond Road and Putney High Street. The flat also benefits from immediate access onto Barnes Common and is within easy reach of the River Thames. 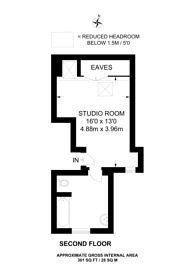 301 (27 Sq M) approx.